A high-performance smart card reader, with a USB interface, in a small form factor for desktop and mobile usage. The HID OMNIKEY 3021 USB is a high-performance smart card reader in a small form factor for desktop as well as mobile usage. The OMNIKEY 3021 USB is an easy-to-install USB device suited for all contact smart card operations like online-banking or digital signature applications. 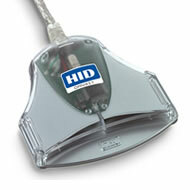 The HID R30210015-1 is also known as HID-R302100151	or R302100151	.